Brenda Lawrence was born on October 18, 1954 in Detroit’s northeast side, where she was raised by her grandparents. Possessing a BA in public administration from Central Michigan University, Lawrence in the 1990s held various positions with the Southfield (Michigan) Board of Education, including secretary, vice president, and president. She was also elected to the Southfield City Council in 1997, and two years later she became its president. A lifelong Democrat, Lawrence was elected mayor of Southfield in 2001 when she defeated the longtime incumbent, Donald Fracassi. She was subsequently re-elected in 2005, 2009, and 2013. In 2004 Lawrence served as a delegate at the Democratic National Convention in Boston. At the next Convention, which was held four years later in Colorado, she was a superdelegate who endorsed Senator Barack Obama for president. Also in 2008, Mayor Lawrence was invited by the U.S. House Oversight Committee to testify about the devastating effect that the mortgage crisis was having on American cities. Later that year, she returned to Washington to lobby Congress for a bridge loan to the automobile industry. During her tenure as mayor, Lawrence made several unsuccessful bids for higher political offices in her state: Oakland County Executive (2008), Lieutenant Governor of Michigan (2010), and a seat in the United States Congress (2012). When Gary Peters, the incumbent Democrat representing Michigan’s 14th Congressional District in the U.S. House of Representatives, announced in May 2013 that he would not seek re-election the following year, Lawrence set her sights on that post. She won the 2014 election by a wide margin, and promptly became a member of both the Congressional Black Caucus and the Congressional Progressive Caucus. Noting that “we are a nation of immigrants,” Lawrence unequivocally supports the DREAM Act, legislation designed to provide discounted college tuition rates and, as the congresswoman phrases it, “legal paths to obtaining citizenship” for young adults who first came to the United States as minors. She is also “against laws such as Arizona S.B. 1070,” a 2010 statute deputizing state police to check with federal authorities on the immigration status of criminal suspects appearing to possibly be in the United States illegally. Lawrence also promotes an “antipoverty agenda” that includes raising the national minimum wage from $7.25 per hour to at least $10.10. In October 2017, Lawrence introduced legislation to require congressional staffers to take an online course on the evils of sexual harassment. “You have to set a tone. You have to establish this benchmark of zero tolerance,” said the lawmaker. The following month, however, three of Lawrence’s former female aides told Politico that they repeatedly had informed the congresswoman about “inappropriate” comments and physical contact by her chief of staff, Dwayne Duron Marshall. Lawrence, claiming to have known nothing about the allegations, placed Marshall on leave pending an investigation. During President Donald Trump’s State of the Union speech in January 2018, a photographer for Getty Images snapped an overhead photo that showed Lawrence playing the game “Candy Crush” on her smartphone. For an overview of Lawrence’s voting record on an array of key issues during her time in Congress, click here. 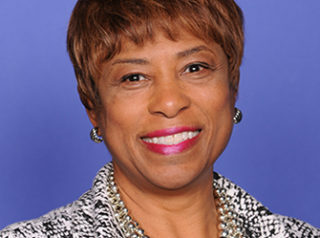 Further Reading: “Brenda Lawrence” (Votesmart.org, Detroit News); “Congresswoman Lawrence Statement on Today’s Prime Minister Netanyahu Congressional Address” (3-3-2015); “Democratic Congresswoman Hit with Eviction Notice from DC Apartment” (Daily Caller, 8-3-2016); “Congresswoman Tolerated Abusive Behavior by Top Aide, Female Ex-Staffers Say” (Politico.com, 11-7-2017); “Lawrence Played Candy Crush During Trump Speech” (Detroit News, 2-1-2018).